The Coast Guard, pollution response teams from the Washington State Department of Ecology and marine inspectors are working to contain a sheen of oil that has formed on the Columbia River near Camas, Wash. The oil is coming from the Davy Crockett, a 431-foot barge that ran aground on the river's northern bank. Divers are trying to determine the leak's precise source, and authorities are looking for any signs of pollution. 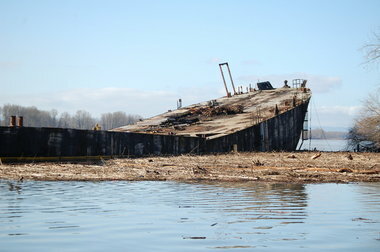 Absorbent materials are being used to soak up the light, non-recoverable sheen, which has spread into the Port of Vancouver, Wash., area - about 8.5 miles from the barge. Responders do not know how much oil remains on the barge and are working to determine the vessel's condition. Officials first saw the sheen last weekend after it first reported. They do not know why the barge ran aground.